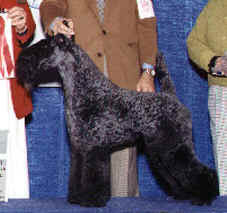 Bonnie Blu WBY Nightingale sired by our Top Producing, two time Specialty winner Ch. 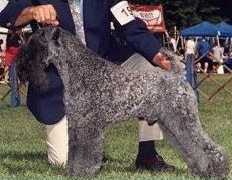 Paxon's Rough Rider, produced two Champions . . .sweepstakes winning Ch. Paxon's Matt Dillon, and his Specialty winning brother Ch. Paxon's Jesse James. Another litter sired by our famous Ch. Paxon's Dancer's Image, produced Ch. Paxon's Dancin' Machine, who finished quickly in the Summer of 96". Her kids have been doing a little producing also. Son "Wild Card" produced two champions this past year....Ch. Paxon's Amelia Bedelia, and her sister Ch. Paxon's Kylemore Riverdance. A son, Rockwell's Angus McDuff recently won a 5 point Specialty Major . "Lady of the Lake" has a winning daughter in Finland. Yet another son "Jesse James" has a major pointed daughter....Bonnie Blu WBY Nightingale. "Vilda's'"last litter, sired by Am/Can Ch. 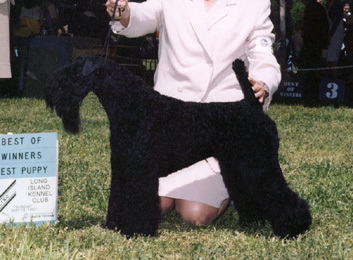 KitEHawk's Black Tie Affair, again produced some exciting dogs, including her young sweepstakes winning son, Paxon's Irish Tenor. "Tetley", this boy has been doing some exciting winning, including two Terrier Group 1sts, and numerous other Group placements. His puppies are just starting to be seen in the ring and are doing well. The best part of this, is that most of these champions are also beloved pets. This goes to prove that these dogs are versatile enough to be, both loving pets and competitive show dogs!!!!!!!!!!! !